“How Many Countries Are There?” is Actually Impossible to Answer. I pose a question with a seemingly simple answer: How many countries are there in the world? That should be a piece of cake. Just count up the number of countries on the map. Or look at the roster of United Nations members. Surely that would yield the definitive number, right? The problem is that when you start taking a close look at world maps you’ll see quite a few discrepancies. Borders of countries vary depending on who wrote the map, because of a number of disputed territories around the world. If we wanted a “definitive” source, we might turn to the U.N., but even that membership list does not quite reflect reality. The U.N. has 193 members, but Vatican City, the smallest independent country in the world, is not included. This situation creates a bit of trouble for the cartographer striving for objectivity. Do you show these two places as independent countries, implicitly supporting their claims of sovereignty? 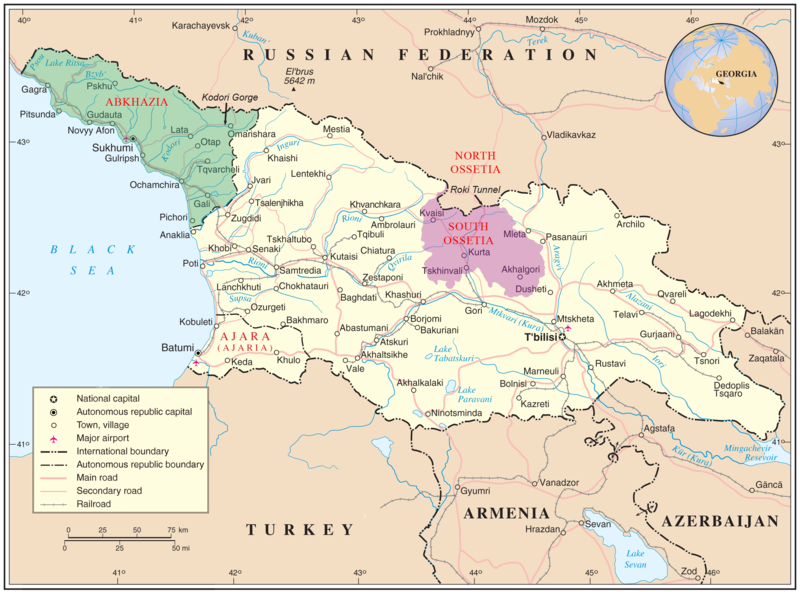 Or do you side with Georgia and most of the international community and show them merely as autonomous areas within Georgia? One cannot completely avoid politics in cartography. As the video indicates, this creates tension for foreign policy as well. These quasi-countries were born of recent or current military conflicts. Recognizing one of them as independent or not means taking a side in that country’s conflict, and any decision you make will anger the other side. A notable example is Taiwan, which the U.S. does not officially recognize as a country so as not to damage relations with mainland China. But for all intents and purposes, the U.S. still treats Taiwan as a separate country, without referring to it as such. So does it get added to the total or not? Should the criteria for being included on the list of countries be legal recognition by the rest of the world? Or simply being acting and being treated like a de facto country? It soon becomes clear that there is no way to come to a definitive number of countries in the world, since there is no universally accepted definition of country. There are 193 U.N. members, 195 countries recognized by the US State Department, and 204 countries that regularly participate in the Olympics (including many non-independent territories, such as Puerto Rico). So how can anyone conclusively answer this question? My suggestion is to just say “about 200”, and you’ll be close enough. Since the year-end busy season at the firm is picking up, I will be cutting back my regular updates from twice a week to once a week. Regular updates will now post on Sundays. Apologies to all my fellow map geeks out there! Here, have an apple for the road. The following map shows that infographics, which are increasingly popular in the internet age, are nothing new. In 1861, President Lincoln pored over this very map of the Southern United States as these states began seceding from the Union. The significance of the map is that it was meant not just to depict the geography of the area, but to display a crucial set of data. 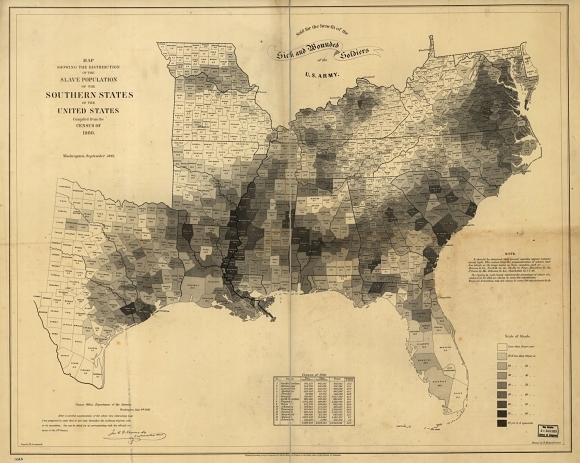 It showed the number of slaves residing in each county of each Southern state. Source: The New Yorker, “Why Abraham Lincoln Loved Infographics”, http://www.newyorker.com/online/blogs/elements/2013/10/why-abraham-lincoln-loved-infographics.html. The Emperor sits comfortably on his throne, looking out upon the lands under his sway. Pontus Euxinus is the Black Sea. Galacia, Ionia, Caria, Pamphilia, and Lycia are all ancient regions of Anatolia or Asia Minor, which is, more or less, the country of Turkey today. Mare Aegeum is the Aegean Sea between Greece and Turkey. In the bottom left, I see what looks like Euboea, the large Greek island right off the mainland. And to the left of the King, on the other side of the Bosphorus Strait, is written: Imperium Constantinopolitanum, or Constantinople. But look again at how the Emperor is positioned. He is gazing Eastward, but his expression is unreadable. Is he proud? Is he anxious? Perhaps both. Perhaps he sees the foreign armies that lay just outside his territory. For hundreds of years, the Byzantines dominated the Eastern Mediterranean and beyond, and then suffered under a long period of decline and territorial loss until 1453, when the Ottoman Turks finally captured Constantinople, ending the Empire for good. 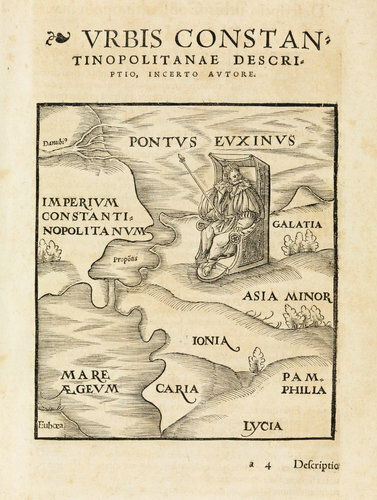 The names of regions in Asia Minor on the above illustration are hardly used today. If you tour these sites, you will be greeted by ruins of temples and monuments built by Romans, Greeks, and various other rulers of the land through history. All of these rulers once looked out at their land with pride, yet all of their reigns ended, their power and reputation fading through the centuries. I hesitate to sound too fatalistic, but it seems that no empire, no matter how mighty, can escape its downfall. I’m reminded of the poem Ozymandias, which was recently used as a prominent theme during the final season of Breaking Bad. Here is a video of Bryan Cranston reading it, followed by the text. It is in reference to an Egyptian pharaoh, but it could easily be applied to any number of historical kings or emperors of once mighty realms which have faded and collapsed over the ages. It is worth keeping this poem in mind, along with the above picture of the Byzantine Emperor whose empire eventually fell. All things fade, and we should avoid the pride of those who believed their reign, or even their reputation, would last forever. I generally avoid getting into politics here, but the current U.S. government shutdown deserves a post. The government has been shut down since October 1, and even though some services are continuing, many others have been abruptly stopped. For example, national parks are closed, which is causing my friend Ben to temporarily halt his plan to visit every national park in the country on a motorcycle. The shutdown has also caused about 800,000 nonessential government workers to be furloughed, which means they can’t work and they don’t get paid until the government reopens. Below is a map posted by the Washington Post showing the areas with the highest percentage of federal workers, and consequently, the areas that will suffer economically the most as long as the shutdown goes on. No matter your political persuasion, the government shutdown is a huge problem with disastrous effects across the United States. Want to see these federal employees get back to work? Call up your congressperson and ask them to end the shutdown now! Next time, back to our normally scheduled non-political reporting. The Yale Peabody Museum of Natural History, in New Haven, CT, currently has a fascinating exhibit on ancient Egyptian artifacts which I recently checked out. One thing in particular caught my eye: a curious-looking piece of a stone slab. It was part of a map, although you wouldn’t know it just from looking at it. 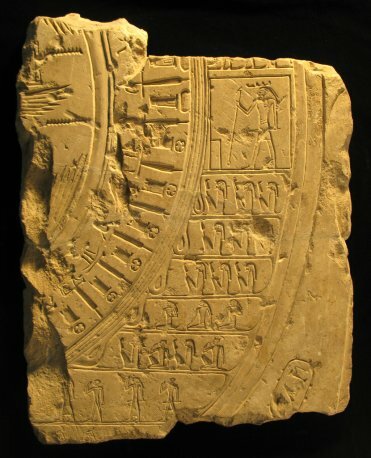 The map dates from 664-332 BCE, during the Late Period of Egypt. It shows how Egyptians viewed themselves and their place in the world, even if their knowledge of the outside world was limited. To us, it seems like the Egyptians saw the world upside-down. The top of the map is actually South, so Left is East and Right is West. But the Egyptians knew that the earth revolved around the Sun, and they placed the Sun in the innermost ring of the map. The next ring, with all the long rectangular figures and circles, represented Egypt itself and all of its administrative districts. Beyond this were all foreign countries, such as Libya, which was, and still is, directly to Egypt’s West. In the outermost region are the “cool waters of Horus”, from which all life began. The next portion of the ancient map, the ring beyond the borders of Egypt, depicts foreign countries, in this case the Libyan tribes who dwelt west of the Delta. Standing enshrined in a rectangular hieroglyph that “temple,” is Ha, tutelary deity of the Western Desert. Below Ha are members of the Libyan tribes who populated the eastern portion of the Sahara Desert, and the line separating the Libyans from Egypt is actually composed of loops of rope binding them to the districts of the Nile Valley. Beyond the Libyan desert and separated by a double line is the final region of the Egyptian cosmos: the primeval, chaotic waters from which all life originated. In the hieroglyphic signs on the map, this outer region is called “the cool waters of Horus;” Horus often appears as a falcon or falcon-headed deity and was worshipped as a sky god closely associated with kingship. The waters of Horus are separated from Egypt and foreign territories, but the boundary between order and chaos is not impermeable. The Nile itself ultimately flowed from these waters, and the ancient Egyptians believed that only the proper religious rituals, which helped to maintain the course of the sun and the divine world, would prevent the chaotic waters from spilling into Egypt.